Pestana is simple, comprehensive, portable, and has accompanying audio that walks you through hundreds of vignettes. Great for the shelf exam. Pre-game. This is nothing like your other rotations. 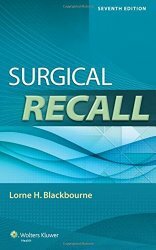 Read the first section of Surgical Recall to orient yourself to what’s expected, what to touch, names of instruments, and answers for all the classic pimping questions you’ll get on rounds or in the OR. Doing a gallbladder? Know Calot’s triangle. Review abdominal anatomy: arteries, muscles, abdominal fascial layers; nerves and veins are less important. Create a notecard with the list of things to check on morning rounds (overnight events, IVs, tubes/drains, I/Os, wound healing, etc.). Shelf. Similar to the medicine shelf, but focused on management more so than pathophysiology. For the bread and butter, you’ll need to know when to manage conservatively and when to head to the OR. Do all the UWorld questions for Surgery, GI, Renal, and Electrolytes, and do them twice. Consider taking one or both of the NBME Self Assessments. 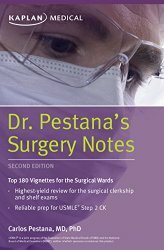 Pestana is an excellent, concise book covering the bread and butter general surgery, but also all the specialties included on the shelf: ortho, neuro, urology, pediatrics, burns, etc. Find the audio that accompanied an earlier version. It walks through several hundred very simple vignettes, each with a slight variation from the previous to emphasize teaching points on differences in management. This is about 13 hours, so listen to it while exercising or on the commute. Surgical Recall is comprehensive, concise, and has answers for all the classic pimping questions. Great for day to day procedures. A more detailed post on Making the most of your surgical sub-internship. Pre-game. Understand how to read an EKG; plenty of great online videos: basics, rate & rhythm, intervals. Brush up on heart sounds. Pocket Medicine has been invaluable. Whenever I’m about to examine a patient for a chief complaint I’m not as familiar with, I hit that page and this gives me questions for my history, physical exam findings to look for, differential diagnosis to consider, and tests to order. Look like a rock star because you covered all the bases. Consider getting a digital copy for your phone/tablet instead of lugging around the little notebook. 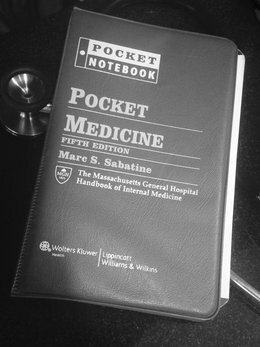 Pocket Medicine has been invaluable in getting a thorough history and physical for common chief complaints. Shelf. UWorld is all you need to do well. Absolutely do all 1300 questions. MKSAP is great but extra. Pregame. Download an app for calculating gestational age based on LMP, US, EDD, etc. There are free ones but Perfect OB Wheel was a cheap one I found to have a great interface. Outpatient. Drill on your gyn/ob history template questions and speculum exam. I ultimately preferred to perform the bimanual exam before placing the speculum because then I knew what I was aiming for. Position and get everything ready before you put on your gloves to begin touching the patient’s anatomy. Practice your bimanual and speculum exam so it’s no longer awkward and you start to focus on fine tuning comfort for the patient. Labor and Delivery. Wear shoe covers. Always. At the start of every shift, get a copy of the roster and go around briefly meeting every patient who might be delivering. No patient wants to meet and greet during active labor. Surgery. Review pelvic anatomy: ovarian artery comes off the aorta, branches of the internal iliac, genitofemoral/iliohypogastric/ilioinguinal nerve paths and cutaneous distributions (watch your retraction), ligaments holding up the uterus and ovaries, etc. Get used to looking at the pelvis from a laparoscopic viewpoint. Perform a bimanual exam before prepping so you get an appreciation for uterus size/position, ovaries, fibroids, etc. If you’re assigned “down below” during the procedure, don’t contaminate “up above”. Shelf. Blueprints covers everything in perfectly simple detail. Skim this early in your rotation, and then reread topics in detail as you go through the rotation. UWise is an excellent free question banks (542 questions) organized into topics plus additional comprehensive self-assessments. Do appropriate topics before rotating on LND, surgery, outpatient, etc. UWorld has about 250 questions you need to hit. Pregame. Specific equipment for the physical exam: reflex hammer, tuning fork, safety pins, ophthalmoscope. Practice your complete neuro exam. Review anti-epileptic drugs for seizure control and pain management, calcium channel blockers for treating vasospasm, beta blockers for lowing blood pressure, and anesthetics. Get familiar with one of the NIH Stroke Scale apps. Shelf. About 220 questions in UWorld covering Neurology and Ophthalmology, plus the two NBME subject tests which were quite similar to the real deal. Neurology Pre-Test is okay if you want more practice, but only if you’ve finished UW and NBME. I’ve heard Neurology Clinical Cases is good but I had my hands full already. Pre-game. Kids are not like adults, so print out some reference material for developmental milestones, a template review of systems so you hit on pediatric-specific questions during your H&Ps, and watch some videos of the pediatric physical exam, carry around a template checklist and try to hit more of it with each new exam. Newborns labs have their own range of normal; get familiar with heart rate, respiratory rate, febrile thresholds in neonates, infants, and toddlers. Get a basic outline of how to workup common problems: respiratory distress, neonatal jaundice, fever of unknown origin, etc. Pediatric H&Ps are not adult H&Ps. If a child is in the first decade of life, you should ask about birth history, feeding, development. Carry a reference sheet with developmental milestones and, for their age, ask about the four areas. CLIPP Cases. Available from MedU. 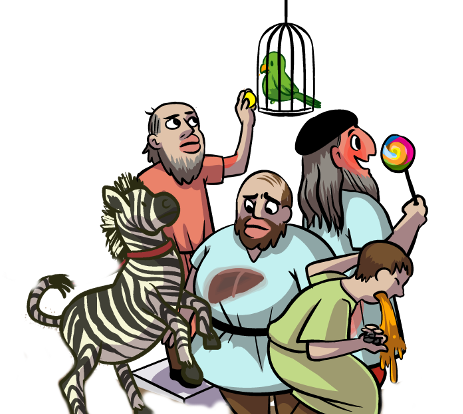 These cover about 30 basic scenarios you’ll encounter daily. Do a quick pass in the first week of your rotations so you’re familiar with the content. Then do a subsequent slower pass to truly study the material before the shelf. Handle with care. You’ll find they’re pretty resilient. I doubt you’ll drop a child, but another important aspect of handling with care involves diaper mishaps. During your physical exam, always position the diaper over a little boy’s private parts. The time when you have them fully exposed should be on the order of seconds. When checking femoral pulses, shields up. Further, before picking a child up to coddle, check the diaper. Your clothes will quickly soak up a wet diaper. This is experience talking. For Peds, OB/Gyn, and Surgery you’ll want to have a full change of scrubs in your locker or car. Nursery. The newborn physical exam looks for specific physical findings from the birth process: birth trauma and deformities from in utero positioning, skin findings such as umbilical site, jaundice, rashes, etc. Your history will need to assess this pregnancy and delivery as well as previous pregnancies. Know jaundice and respiratory distress cold. Normal vitals are unique in the first few days. Interviewing. Be nosy. This isn’t regular society where you tip-toe around issues. Patients don’t always volunteer, so always be digging. Screen for everything kind of thought or behavior: mania, depression, auditory/visual hallucinations, etc. Several times I was embarrassed when after a relative normal interview I would read a chart and realize I had been talking to a patient with some crazy back story I didn’t elicit. Shelf. UWorld (all 150q) + Lange (most of 750q). Know where general medicine and surgery meet psychiatry: delirium, liver/renal/cardiac co-morbidities to psychiatric drugs.